So says Ludwig von Mises in his most thorough defense of the method and scope of economic science. In this treatise, he argues that the core intellectual errors of statism, socialism, protectionism, racism, irrationalism can be found in a revolt against economic logic and its special character. This treatise, out of print for many years, is brought back by the Mises Institute in a 3rd edition, with a comprehensive introduction by Jorg Guido Hulsmann, senior fellow of the Mises Institute. 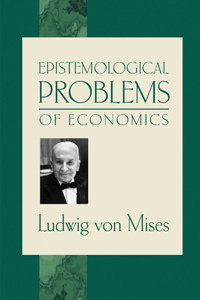 He observes that "the great majority of contemporary economists, sociologists, political scientists, and philosophers are either completely unaware of Mises's contributions to the epistemology of the social sciences or think they can safely neglect dealing with them. They are in error. One can ignore a thinker, but the fundamental problems of social analysis remain. There will be no progress in these disciplines before the mainstream has fully absorbed and digested Mises's ideas." I am still trying to grasp a lot of the ideas in here. It was clearly written for a specific time, yet unfortunately some ideas he debates are still prevalent today (scientism, historicism, etc.). I recommend reading this before Theory and History; this book is almost a precursor to Theory and History. Also, I'm a little confused why the last chapter on Inconvertible Capital is included in this book. It is kinda a non sequitur, but it was still insightful. This book is also an expanded version of what the first 92 pages of Human Action would be. So read this before Human Action too, it'll provide context for arguments he makes. While Mises' preoccupation with the shortcomings of German Historicism is a little anachronistic in this day and age, his exhaustive discussions of the shortcomings of polylogism are the best I've ever read on the topic. The subject matter is quite dense and abstract, especially compared to modern-day economic books, so read it slowly and patiently, and take the time to understand each idea. While you need not be well-versed in the history of economic thought, some prior knowledge of the German Historical School (especially its critiques) is strongly recommended, as is a cursory knowledge of the main schools of philosophical thought. Having said that, this book stands as a testament to how well-rounded a scholar Mises was, and how he drew from his knowledge of every discipline to weave together complex logical concepts and express them concisely. Had I lived during the 1920s, I would have rated this 5 stars. Because it needs to be modernized for today's world, 4 stars.